The Chicago Blackhawks will once again have a reshuffled lineup when they take on the Buffalo Sabres on Friday night. The lineup changes come after a blowout defeat at the hands of the Washington Capitals on Wednesday, and they feature a rookie in a new place. That rookie is winger Alex DeBrincat, who will skate on the team’s top line alongside Brandon Saad and Jonathan Toews on Friday. DeBrincat has been one of the team’s top scorers in recent weeks, racking up 10 goals and five assists since the beginning of November, and Joel Quenneville will hope that he will add some offensive upside to a line that hasn’t produced much this season. Artem Anisimov and Patrick Kane will also be reunited on the team’s second line, and Nick Schmaltz will shift from center to wing to accommodate the move. The bottom six have some question marks, as Vincent Hinostroza was recalled by the Blackhawks on Friday. 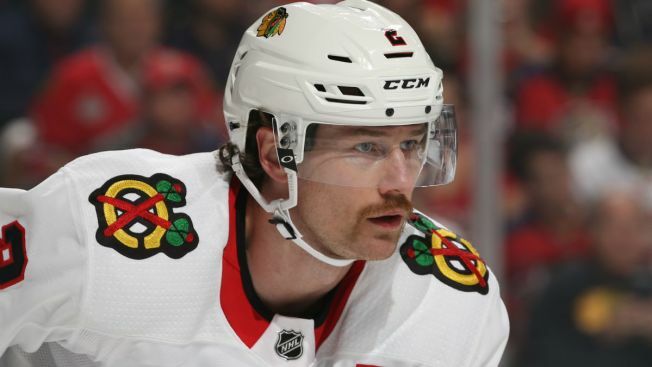 He could theoretically jump into the mix, but Quenneville has not indicated which of his players would make way for the youngster if that is indeed the direction that he goes. Goaltender Corey Crawford will be back in net for the Blackhawks after missing the last week with a lower body injury. He was activated from injured reserve prior to the game, with Jean-Francois Berube heading back to Rockford. The Blackhawks have been getting a ton of shots from their blue liners in recent games, but goaltenders have had a relatively easy time stopping them as screens have been virtually non-existent in front of the net. Duncan Keith is the player that has been victimized most by this failure to screen goaltenders, and his struggles are quickly becoming remarkable in nature. Keith has failed to score on his last 94 shots on goal dating back to last season, and he had seven shots in the team’s loss to Washington on Wednesday night. Whatever the cause of Keith’s issues, traffic in front of the net will only help him, and the rest of the team, as they try to score enough goals to put away a bad Buffalo squad on Friday.